Social media banking. ING Direct Australia partnered with StartSomeGood to launch Dreamstarter, a P2P crowdfunding platform, to support social change projects (CSR). Dreamstarter, a new crowdfunding initiative, offers social entrepreneurs an online platform to raise funds towards diverse social change projects. Successful projects that capture the imagination and support of the community will receive additional funding from ING Direct, a pioneer of branchless banking and social media in Australia. Once a month, a Dreamstarter panel made up of representatives from StartSomeGood, ING DIRECT, and the School for Social Entrepreneurs will select projects on the StartSomeGood platform to fund if they reach a threshold corresponding to the minimum funding needed for a project to kick off. Ten ventures by social entrepreneurs that graduated from the School for Social Entrepreneurs Australia will launch in the initial round of fundraising through the Dreamstarter platform. The first enterprises to go live include a project to connect remote Aboriginal entrepreneurs to new markets via an online store (Enterprise Learning Australia) and an initiative to help rural communities in Malawi to achieve greater self-sufficiency (Empower). I invite you to find out more on Dreamstarter by watching the video on youtube, ‘CSR Meets Crowdfunding: ING Direct and StartSomeGood Launch Dreamstarter‘. 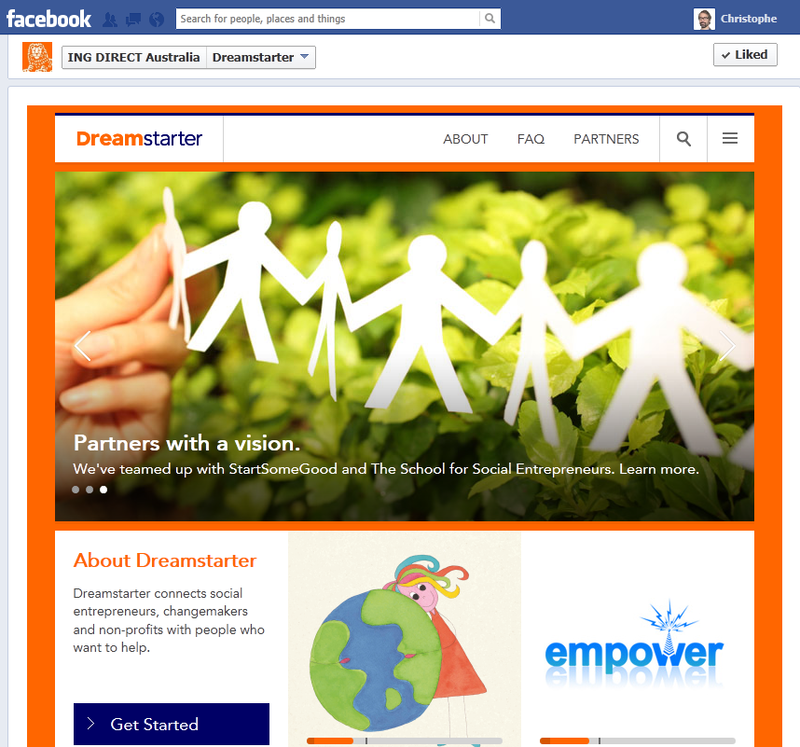 ING Direct integrated Dreamstarter into its facebook page with a dedicated, interactive, tab. Tom Dawkins – coFounder of StartSomeGood: “Crowdfunding is a participatory model that democratises corporate philanthropy. The projects that will succeed are those that have a genuine mandate from the community”. Celia Hodson – CEO of the School for Social Entrepreneurs Australia: “The Dreamstarter Campaign is a fantastic way for start up social ventures to raise their profile, attract critical seed funding and inspire others to create change in their communities”. I am a huge supporter of any meaningful initiatives in the crowdfunding space focusing on Corporate Social Responsibility (CSR) and aiming to support local communities and social projects. ING Direct is not the first financial institution in Australia to tap social media for CSR: Bendigo and Adelaide Bank launched PlanBig a couple of years ago. In this case, don’t expect some kind of sophisticated online platform a la kickstarter.com or an online communitiy a la Kiva.org. This initiative doesn’t push the innovation envelope, but that’s fine. What do you think of ING Direct’s Dreamstarter project? I invite you to share your comments and your best practices on social media applied to CSR here or on twitter.